Calvin Klein socks are ideal for active sports fans who like to push their limits time and time again. Combining innovative fabric technology with a stylish and superior fit; Calvin Klein men’s socks keep your feet dry and comfy for unbeatable performance in almost any sport and activity. At Excell Sports, we offer only the best styles and materials, which is what you get when you go for Calvin Klein. 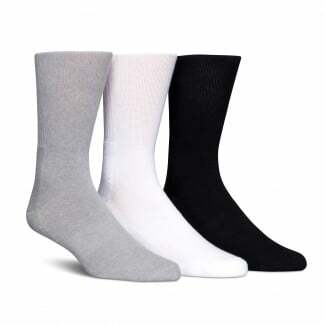 You can choose from three-pack ankle or crew socks, and all our designs feature Coolmax technology that immediately wicks sweat from your skin to keep your feet dry. Whether you’re working out at the gym, having a kickabout in the park or heading out for your evening run; these Calvin Klein socks will keep your feet cool and fresh to keep you exercising for longer. 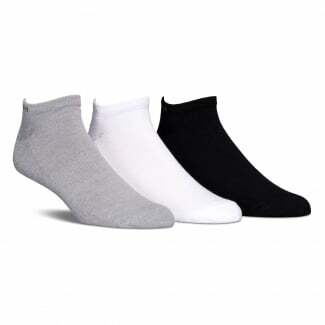 Our Calvin Klein men’s socks come in neutral and stylish shades including grey, black and white to suit whatever colour you like to play in best. With stretch cotton fabric and your choice of block-colour or assorted packs, Calvin Klein socks make the ideal, versatile addition to your sports kit. Check out more leading sports brands in our range of men’s and women’s socks.